Two weeks ago the United Nations Food and Agricultural Organization (FAO) released a new report, “Tackling Climate Change Through Livestock,” which has captured media attention. One of the most frequently cited statistics from the report is the new estimate of how the livestock industry contributes to global greenhouse gas (GHG) emissions. In the 2006 report, “Livestock’s Long Shadow,” the estimate was 18 percent—higher than the entire transportation sector—and the new 2013 estimate has been lowered to 14.5 percent. This updated figure and the accompanying report that describes how it was reached have important implications for policymakers. They can use its in-depth analysis of various mitigation strategies to redesign policies that provide the support and institutional frameworks needed to reduce sector emissions efficiently and equitably. It is well known that animal agriculture (particularly the cow belching, animal manure, and feed crop production associated with it) is a significant source of the GHGs that contribute to climate change. But estimates of livestock’s contributions range from three to 51 (!) percent of total emissions, fueling arguments on both sides of the meat-eating debate. Why is there such a large discrepancy in estimates? One reason is that it depends on whether one is calculating the percentage nationally or globally. 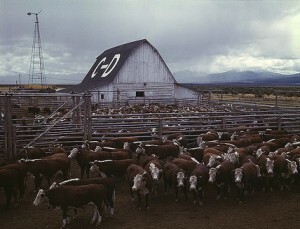 In highly industrialized countries like the U.S., livestock production represents a smaller proportion of the country’s total emissions (the EPA states 6 percent for the entire agricultural industry, although more holistic estimates suggest ~9 percent for livestock production alone) simply because we emit a lot more through our coal-fired power plants, factories, and gas-guzzling SUVs. Big Ag and Big Meat often cite the lowest figures; of course, by citing the lower figures, their implicit contribution to climate change is reduced. Some of the confusion surrounding these figures comes from the fact that these are reported as percentages of total emissions instead of the amount of emissions themselves. For example, while livestock production accounts for only ~9 percent of total U.S. GHG emissions, U.S. livestock production emits 600,833,286 metric tons of CO2e per year. This is still a lot of emissions relative to Ireland, which emits 16,705,362 metric tons of CO2e in the entire agricultural sector (much of it attributable to the country’s livestock production) but represents 32 percent of their country’s emissions. When assessing the livestock industry globally, the picture gets even more muddled. Estimates of livestock’s contributions to global emissions are much higher —ranging from eight to 51 percent. Many scientists and ag industry advocates have criticized these estimates over the years, leading to general confusion in the field. Another key reason for confusion is that different estimates define different “system boundaries.” Many argue that estimates for livestock GHG emissions should include emissions from feed production and land use (including deforestation in developing countries for grazing area), as well as those from processing and distribution. Even if one agrees that these factors should be included, different methods are used to account for land use change, transportation, and processing. One must also consider the mitigating potential of alternative production schemes. For example, the carbon that is sequestered in healthy soils by grass-fed livestock could be counted as an offset to other livestock-related emissions. Others define the boundaries much more narrowly, and will consequently come up with smaller estimates. The far-reaching impacts of this report make the topics it chooses to cover crucial. The 14.5 percent figure is relevant because policymakers will use it to drive mitigation efforts. That said, despite the report’s aim to be “a global assessment of emissions and mitigation opportunities,” some experts have been criticizing the fact that the mitigation part focuses overwhelmingly on production-side approaches. This is in spite of growing evidence that consumption changes can and will be important in reducing the sector’s overall GHG emissions. Just doing the simple math finds this omission concerning if one is seeking to reduce the overall sector’s emissions. The report describes how incentivizing better practices in feeding, health, husbandry and manure management could reduce the emissions intensity of production systems by 30 percent. However, the report also highlights the fact that livestock production due to increasing global demand is expected to rise 70 percent by 2050. Without changing the demand side of the equation, total sector emissions will inevitably increase, too. As the FAO’s report is arguably the most widely circulated source of information available on the contribution of animal agriculture to climate change, the writers didn’t take advantage of this opportunity to focus more on the potential impact of reduced consumption on global emissions. Scientists have already been investigating and reporting the benefits to cost, health, food security and mitigation effect of lower consumption scenarios. This research demonstrates that there needs to be more policy devoted to addressing the demand side of animal product consumption. This report could have highlighted such approaches and brought this research to the broader public agenda. The FAO recognizes the “urgent need for collective and global action” to mitigate human contributions to climate change. Animal products that are produced sustainably and humanely, and consumed in appropriate amounts around the world, can be part of the mitigation solution, but only if leaders recognize and support all aspects of the needed shift to get to this level. Meanwhile, as the world community waits another 5+ years for the FAO to perhaps include these considerations in its next mitigation report, you can start reducing the GHG intensity of your diet with this great guide from the Environmental Working Group. Why not start with a Meatless Monday?